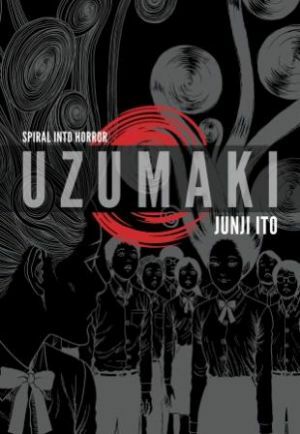 VIZ Media Unleashes Giant Spiral in "Uzumaki: Deluxe Edition"
Uzumaki is a horror manga from creator Junji Ito, originally published in 1998 and 1999 in the manga magazine, Big Comic Spirits. In 2001, VIZ Media first published the series in North America in three volumes, and re-released the three volumes in 2007 in new editions. Now, VIZ Media has collected this masterpiece of horror manga in a deluxe hardcover edition, simply entitled Uzumaki: Deluxe Edition. Uzumaki is set in Kurôzu-cho, a small fogbound town on the coast of Japan and focuses on one of its citizens, Kirie Goshima, a quiet, reserved teen girl. Being quiet and reserved makes Kirie an astute observer of the peculiar events that strike her hometown. The pattern uzumaki – the spiral – haunts the town, and the inhabitants of Kurôzu-cho are pulled into something from which there is no return. In Uzumaki, Vol. 1, Kirie Goshima gets strange news from her withdrawn boyfriend, Shuichi Saito. He tells her that their town is haunted not by a person or creature, but by a pattern, the spiral (uzumaki), but Kirie quietly has her doubts. Eventually, even she cannot deny how the spiral pattern manifests itself all over town – in seashells, in the clouds above, and even in the whirlwinds (or dust devils) that plague the streets. In Uzumaki, Vol. 2, the horror of the spiral is actually becoming increasingly more bizarre. First, Kirie finds herself plagued by a practical joker who is obsessed with her. Then, Kirie’s hospital stay becomes a lesson in pre and post-natal care when hungry mothers and their infants become very picky eaters. In Uzumaki, Vol. 3, the citizens of Kurôzu-cho find themselves cut off from the outside world. Titanic typhoons (hurricanes) and whirlpools keep the Japanese Navy from reaching the village. As the pattern of the spiral completely takes over the town, Kirie and her boyfriend, Shuichi Saito, embark on a final quest. THE LOWDOWN: It opens with a benign landscape of a young woman standing on a mountain road that overlooks her coastal hometown. The second and third pages, a double-page spread, are decidedly less benign. Now, the young woman, our heroine, is ever so close, yet not so close, to a vague maelstrom of swirling, imprecise wind. This is Uzumaki, and we are about to follow heroine/lead character/protagonist, Kirie Goshima, into a bizarre tale of a cursed town. Through her, we experience one of the weirdest of weird horror stories. Uzumaki is “manga;” in fact, it is a manga masterpiece. However, creator Junji Ito offers a work that goes beyond borders. Some may call it manga simply to keep it in a ghetto, away from other kinds of comics. Comic book, graphic novel, bandes dessinee, manga: This is visual storytelling that transcends language and national origins. Many comics and graphic novels make little sense to readers other than to their intended audience. [This is the case with some superhero comic books.] Uzumaki does not suffer from this because Ito’s story is built around the kind of fears with which we can all identify – the specter of death, loss of control of our lives, and our own paranoia. Like the citizens of Kurôzu-cho, our lives are often delicately constructed. Hit a weak point and much if not all of it comes tumbling down. Some people don’t even have the strength or the time to save or rebuild their broken lives. As it begins, Uzumaki presents a town full of people slowly sinking into madness, unable to stop decay and eventual death. All the readers have to hold onto is Kirie, who’s sane… for now, because it is going to get worse. Reading Uzumaki again, I am struck by how the story feels not so much fresh as it does feel like an old horror that is always ready to get inside the reader’s mind. POSSIBLE AUDIENCE: Readers who are looking for the best of the best comics and manga will find it in Uzumaki: Deluxe Edition. Readers who are searching for crazy/cool horror will find a big massive serving of scary in Uzumaki: Deluxe Edition.